Greater Flamingo is the biggest flamingo in the world. They are also the most widespread species of the flamingo family. You can find them in both freshwater and saltwater habitats in central and south America, the Caribbean, South West Europe, Southern Asia and parts of Africa. They live on lakes, estuaries and lagoons. The Greater Flamingos which live outside the tropics often migrate to warmer places during the winter. They prefer warmer weather. 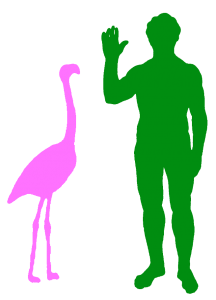 Like all flamingos, they live in colonies which consist of thousands of flamingos, except in the Galapagos islands, where there are only a few dozen. Living in colonies protects them from their predators. They are on average about 110-150cm (44-60in) tall and weigh about 2 to 4 kg( 4.4-8.8lbs). They have a wingspan of between 1.4-1.7m (4.5-5.5 feet). The largest male flamingo was 187cm (74in) tall and weighed 4.5kg (10lbs). They are pinkish white in colour but their chicks are born grey. They have long, thin, pink legs. They have small webbed feet which help them to swim and stir up food from the bottom of their mud. They also have long, lean, curved pink necks with a black tip. Their wings are red with some black feathers. They have a loud, deep honking call like a goose. They eat insects, worms, small shrimp, seeds, blue-green algae and mollusks. They will normally feed during the day. They will place their bill upside down into the shallow water and pick up food. Their special bill is able to filter out their food from the mud and water. 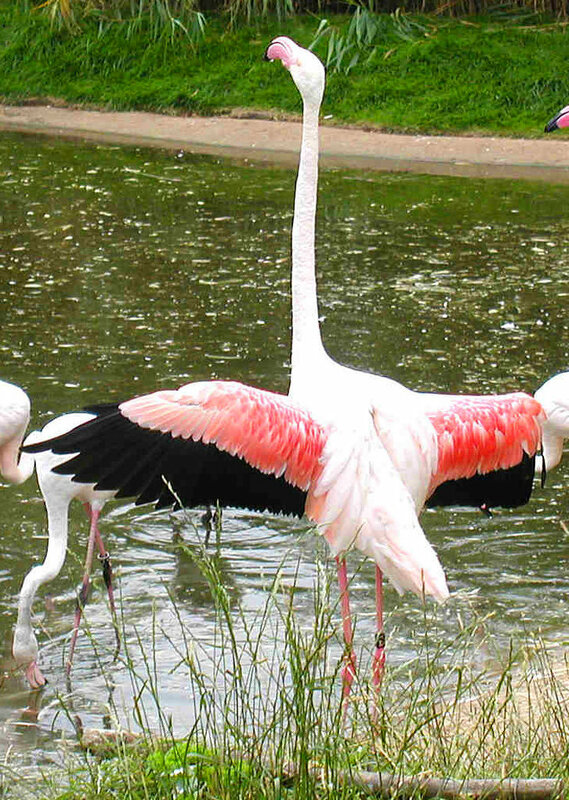 Having lots of shrimp and beta carotene in their diet will make the flamingos look pink and pretty. 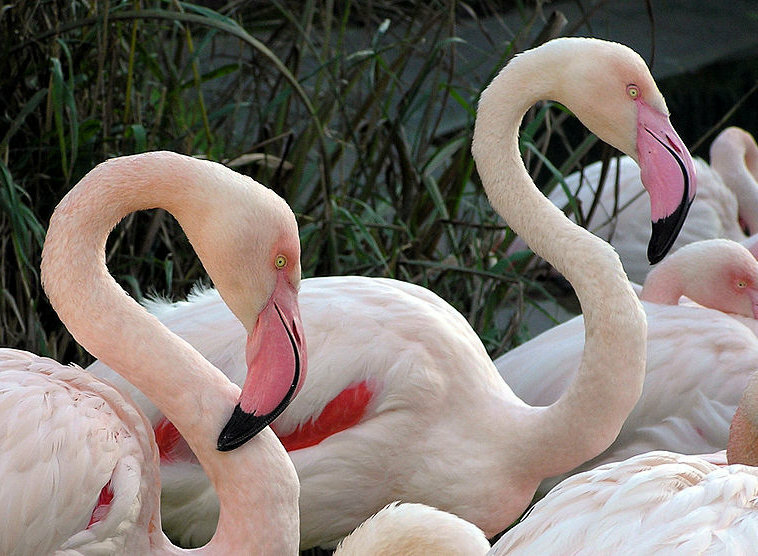 Greater Flamingos breed in colonies. They lay one chalky white egg on a mud mound in a shallow water. Both mum and dad will take turns to keep their egg warm. It will take about 26 to 31 days for the egg to hatch. They will protect their nests during the breeding season. The chick is fed with crop milk which comes from the parents’ upper digestive tract. Both mum and dad produce crop milk. When the chick is old enough to walk it will be sent to a big group of chicks called a creche, which will be watched over by a few adult flamingos. The chick will shed its grey feathers and get the pink and red ones like their parents when they reach between 2 to 3 years old. The Greater Flamingo’s egg is preyed upon by humans and other birds like the marabou stork. It is a large wading bird. They can live up to 50 years old in captivity and an average of 20 years old in the wild.